Ghost stories, especially ones that come in the tasteful wrapping of the literary novel, often seem haunted far more by metaphor than the supernatural. The ghosts aren’t mere ghosts; they’re symbols representing some repressed aspect of the protagonist—her dark desires, his secret crimes. 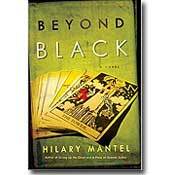 So there’s something refreshing about the initial lack of ambiguity of the ghosts in Hilary Mantel’s new novel, Beyond Black: These aren’t psychic conceits, but otherworldly, fiendish, Scooby-Doo–style ghouls. Mantel—a funny, scathing British novelist, too long ignored in the U.S.—is a master of dark subject matter, and in her latest, she’s created a protagonist who’s accustomed to darkness: Alison, a psychic, a woman trying to live a pleasant life, if it weren’t for the ghosts that keep tormenting her. The opening scene of Beyond Black gives us an account of one of her performances; it’s a sustained, cohesive, enchanting piece of writing, akin to the long tracking shot that kicks off the film Boogie Nights—highlighting Alison’s skillful mixture of manipulation and genuine psychic skill. First, Alison plays on the audience’s insecurities: “I’ve got your mum here,” she tells one woman. “You need to drop a stone, she’s saying.” She wows them with her clairvoyance about their remodeling projects. Occasionally she even locates their long-losts. It’s a pleasure watching her ply the tricks of her trade, maintaining an uneasy balance between the worlds she calls “earthside” and “airside”: She doesn’t just give her customers what they want; she tells them what to want. Offstage, however, Alison is at the ghouls’ mercy. These hauntings can have a down-home charm. She’s forever being hounded by dead old ladies who’ve lost a button: “A certain class of dead people was always talking about cardigans,” she muses. And then there’s her spirit guide, Morris: “Other mediums have spirit guides with a bit more about them—dignified impassive medicine men or ancient Persian sages—but she had this grizzled grinning apparition in a bookmaker’s check jacket and suede shoes with bald toe caps.” Morris, who likes to slump on Alison’s bedroom floor and fondle himself, first met his hostess earthside, when she was a child, suffering a childhood too grim to be called merely Dickensian. Raised by a prostitute mother, Alison was sent to work, early on, on the living-room couch. Men hung about the house, drinking, betting on dog fights, and getting a leg over. And that’s just the part she can remember: The rest, the worst, she’s blacked out completely. To keep the fiends at bay, Alison decides to hire some help: the bitter Colette, who proves perfectly serviceable as a kind of paid roommate. But when Morris begins bringing around the old (dead) bordello crowd, Alison’s equilibrium is destroyed. Mantel writes these ghosts so freshly, with such detail—the yellowing face, the creaking leather jacket—we never stop to wonder if the ghosts are projections. Alison’s ghosts are real, and their battlefield is the supernatural. Yet we feel just as deeply the horror of Alison’s childhood. Neither earthside nor airside is more real than the other. If there is symbolism here, it’s reciprocal: The ghosts reflect Alison’s childhood abuse; Alison’s childhood abuse reflects the epidemic evil of the world, which is always looking for a way to manifest itself. One senses that Mantel writes so exhaustively about human evil because she hates it so profoundly. That makes her sound hopelessly do-gooderish, like a literary Bono, but Mantel’s brand of morality has a kind of vicious glee to it. She gives us a story of evil overcome and wounds healed, but she also scares the pants off us. She would have us believe that the most appropriate response to evil is not tears but terror. Henry Holt. 365 pages. $26.